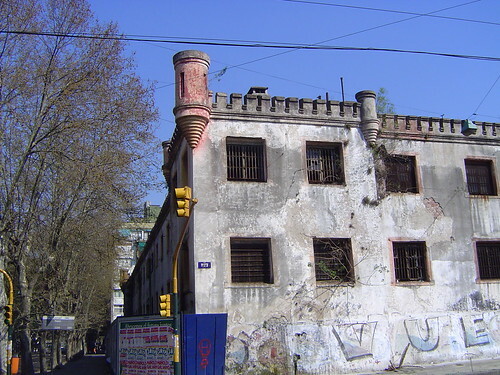 Continuing my walk along Av Caseros beyond the hospital zone I saw on the next block an old building with a turret. At first I couldn’t imagine it’s purpose, thinking that the turret must have simply been decorative. That would have made for a rather odd touch but then there are a lot of unusual buildings in Buenos Aires. 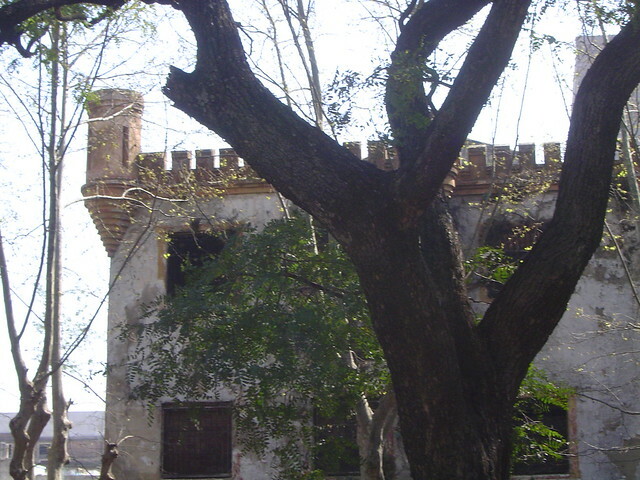 Then I remembered a recent conversation with Robert who mentioned the old prison in Parque Patricios. From half a block away the prison wasn’t what I was expecting. Perhaps it was the seemingly innocuous nature of the place but the Old Jail in St. Augustine, Florida came to my mind. Yet, this was no tourist attraction. As I rounded the corner I saw the full extent of the abandoned prison and the more recent two towers that contained the cell blocks at the rear. Robert has a couple of posts about the old prison: one about a documentary of interviews with political prisoners who were housed in the prison. Another about a recent art project about faces that appear in the windows of the prison. I remember Robert telling me about this project and reading his post on it last month. So, when I was there on Saturday I went down the side street and looked for the faces. Honestly, I couldn’t quite see anything that looked like faces. I did see the windows and the patterns but the shapes didn’t quite appear to me. But after reading Robert’s post again, perhaps I wasn’t standing at the appropriate angle. So, I’m going back for another look. Besides, Gabriel’s blog dedicated to Parque Patricios reveals that the barrio – like so many areas of Buenos Aires – offers much more to explore. There’s still more to come from my walk last Saturday, stay tuned. What? You didn’t tell me you were going to Parque Patricios. How could you without me? 🙂 The 3 of us should go together one day… but how do we combine those schedules? The worst part of the demolition project is that they will get rid of the old prison as well as the multistory monster. It’s from Sarmiento’s era… what are they thinking? If you give me the option of putting up a shopping mall vs. conserving an old prison, my choice is pretty obvious.